Recently Rob Carrick of the Globe & Mail, wrote an article called The mysterious world of RESPs revisited. The article featured the seven trickiest RESP rules which I had suggested. In fact, my original list had 10 tricky rules and since I’m not the type of blogger who leaves anything on the cutting room floor – I thought I’d share the remaining three rules. To make withdrawals from an RESP, proof of enrolment to an eligible institution must be shown to the financial institution. You never have to justify the withdrawals. 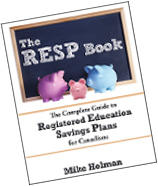 If an RESP account is opened up for a child, eligibility for RESP additional grants and CLB (Canada Learning Bond) is determined by the family income of the primary caregiver. The income of the person who opened up the account is not relevant, unless they are the primary caregiver. If a high income grandparent opens an RESP for a grandchild who’s family income meets the qualification for additional grants, then that RESP account can receive additional grants. 3) You don’t need a family plan RESP to share money between siblings. RESP money can be shared between siblings, even if the money is in separate individual RESP accounts. It’s not quite as convenient as a family plan RESP, but it can still be done without penalty. You can even share RESP money between cousins, as long as the grandparent is the subscriber. Stepchildren are considered the same as birth children for this purpose.